Good questions! As a heads up, Nels is usually pretty busy tuning bikes so isn't in here a lot. To get someone's attention, add an @ symbol before their name and it will send them a notification. 2wheeldynoworks will see this and hopefully have time to login and answer. They also answer emails pretty quickly too. That's an awesome feature. Thanks. 1. Yamaha quickshifter works fine. 2. Do not disconnect O2 sensors until AFTER ECU has been flashed to avoid codes... Plug ECU back in. Disconnect O2 sensors. 4. Flash can void warranty on ECU, but not the warranty for the entire machine. The dealer would have to prove that the flash was the direct cause of the failure. In the event warranty work is needed, we have the original tune file image saved out of your ECU, and can flash it back to stock at any time you need, before taking the bike in for any warranty work. The only cost for this service is just to cover the return shipping charge. Thanks guys. You guys are awesome. Should I disconnect the battery's ground cable before removing and re-installing the ECU? sorry for the late reply but you don't have to no. Overnighted mine to you today. right on. keep an eye on the tracking! I just have some questions about the tune because I am a newbie when it comes to something like this. Is the ECU flash for de-cat modification universal? As in it doesn't matter what exhaust system choice we have gone for? I am getting an Austin Racing exhaust and on the forums it seems like tunes available are for Hindle, Akrapovic and Graves so I'm not sure if the tune is limited to those brands. Will I need a separate tune if I wanted to have a baffle in vs. baffle out? I know the O2 sensors are going to be disabled after the tune but can I keep it inserted in the mid-pipe instead of removing it completely? I apologize for having so many questions. I've never had professional tuning done so I have no idea what to expect. You might wabt to either call him or send him a pm. Or, at least put an @ before his user name like this 2wheeldynoworks to get his attention so that he sees this. When you add an @ in front of someones username in a post, it sends them a notification. They are usually pretty busy at work so may not see this. Hey everyone. I'm thinking about reflash and I got a couple questions. Suppose that I left the bike completely stock, leaving the cat and stock can, and sent in the ECU for a reflash. What would the power gains be? Also, is there a change in average gas mileage after a reflash? Even with stock exhaust, you would still pick up at least 8 hp, maybe even more. On a light motorcycle, that kind of power is very noticeable. I am running the stock exhaust and mpg dropped 3 - 4 mpg with flash. Will the ECU flash void the warranty? ECU back in the mail yesterday to get reflashed for the new exhaust and smog plates!! 1) -Will the EXUP, AIS, and O2 sensor disable with your flash allow me to remove the aftermarket plugs (servo buddy, etc) that keeps the CEL off? 2) -Do you recommend modding the airbox with the flash? I've been thinking of removing the snorkel in the box and opening up the intake area. 3) -The FZ10 has strong engine braking. Will the flash soften this? 4) -What changes are made to the Std, A, and B throttle modes? I like A mode. I feel that Std is too lazy and B mode too twitchy/sensitive. 5) -Would I notice any improvements with fine tuning to my bike if I added a PCV Autotune after the ECU flash? I am in Virginia so I can't come by for a custom tune. 1) Yes, Nels flash disables this so you can remove the servo-buddy if you want. 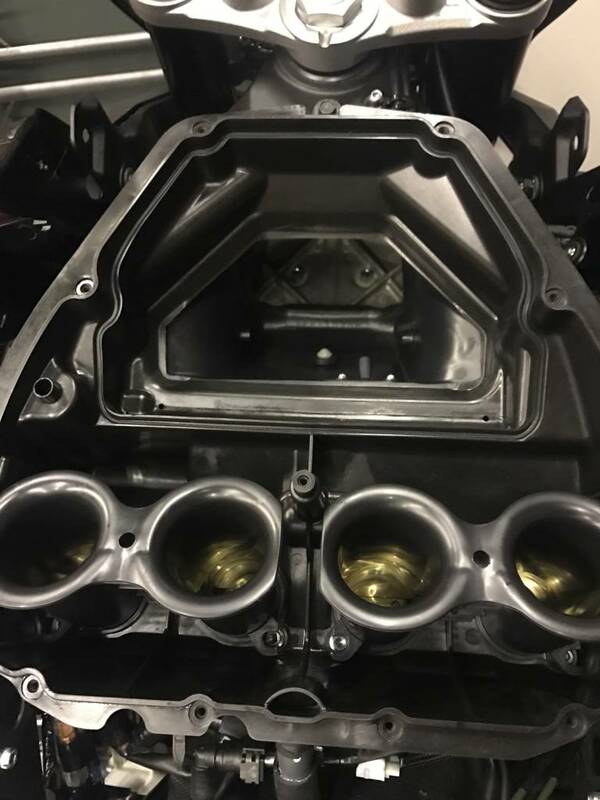 2) Nels can answer for sure, but I think his flash-tune did not mod the airbox (unless he made a seperate one for this) so doing so will likely change how his tune behaves. 3) It does soften this, but the engine braking is still there. 4) I think different people have different results, some have noticed much improvement, orthers not so much. For me, after Nels flash my throttle response actually feels more twitchy/sensitive. Might be altitude and other environmental variables playing into it. 5) Nels can better answer here as well. With my local dyno run after Nels flash, I'm running lean, 14+ range (again I think my high-altitude plays into it) and I've been thinking of getting an auto tune to help it. But not sure how well autotunes will work with an FTECU flash. I've been meaning to contact Nels to go over my scenario to see how I can better tweak my bike post-2WDW flash as well...hoping I'll have a chance to call 2WDW this week. Interesting that you're running lean at high altitude. I would think that at altitude you'd run richer due to thinner air. More info on the changes to the throttle modes and post-flash tuning options are all I need I think to commit to the flash!